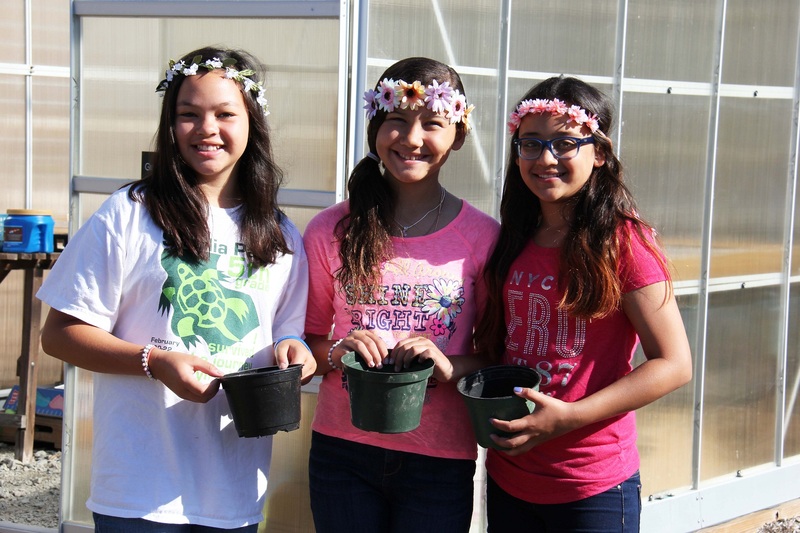 Meet the Greenhouse Girls – Kendall Coss, Kailey Ramirezhuezo and Aneeya Rao. Don’t let their delicate flower headbands fool you. They battle unruly weeds. They construct benches. And they convert car and truck tires into planters. All with their bare hands. “Weeds don’t stand a chance around the Greenhouse Girls,” proclaimed Seatack Elementary gifted resource teacher Marie Culver. Move over, Marvel Comics superheroes. The Greenhouse Girls are ready to show their might. 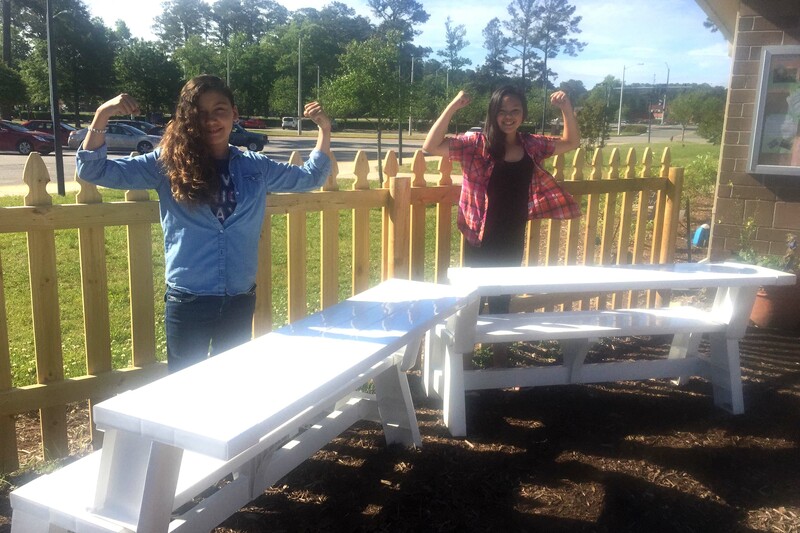 Ramirezhuezo and Coss stand by the benches they assembled. It was Coss who initiated their work. She approached Culver to ask how she could help in the school garden like she’d seen her male peers doing every morning. Culver established the all-boys Garden Breakfast Club last year as a unique way to provide male students with additional support. Coss wanted in on the fun, and she knew of a few female classmates who were also interested. Enter Ramirezhuezo and Rao. The two were already involved with Culver’s Go Green Club, and they wanted more work in the garden than their monthly club meetings provided. So in February, the Greenhouse Girls were formed, and the trio got to work. Coss credits Ramirezhuezo with the Greenhouse Girls’ signature flower headbands, inspired by their studies of ancient Greece. “She’s more of a fashionista,” said Coss. A Virginia Beach Education Foundation (VBEF) grant funded by RRMM Architects, P.C. helped Seatack break ground on its garden last school year. 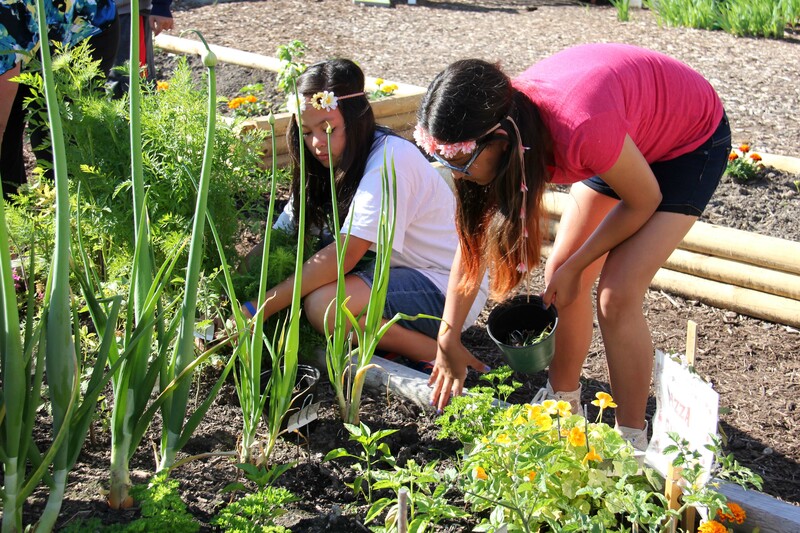 With additional VBEF grant funding this year from the Future Leadership Partners of the Hampton Roads Community Foundation, the school garden continues to grow. Each grade level has a place to grow flowers, plants or vegetables. There is a mentor garden, stump seating area, picket fence, greenhouse, bowling-ball solar system sandbox and more. And while funding from generous VBEF grant underwriters may have established the green space, garden maintenance and growth are credited entirely to Seatack students. It is work of which they are extremely proud. “For me it’s about freedom of choice. I mean, look ̶ this garden is literally run by children,” said Coss when asked about her favorite part of being a Greenhouse Girl. Ramirezhuezo and Rao agree that being outside and taking care of the flowers and plants are what they like best. As the trio of girls set out to tackle their arch nemesis – weeds – the Breakfast Club boys are moving wheelbarrows of mulch and spreading it throughout the garden. Culver noted that while there are “the girls” and “the boys,” there is only teamwork, not rivalry, to ensure the school garden thrives. “The boys are really appreciative of the girls helping with the weeds. They know the girls won’t miss any because they are so detail-oriented,” Culver praised. 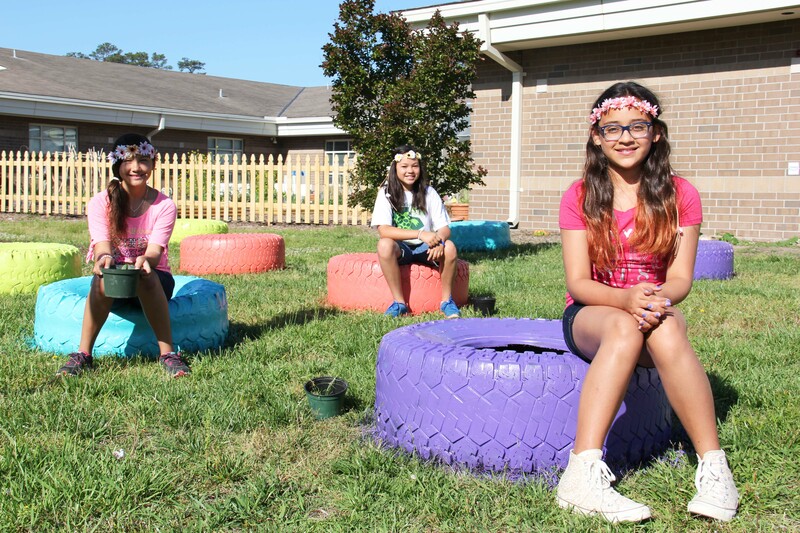 The students are combining forces for an upcycling project to convert car tires into a pollinator garden that will decorate the back corner of their green space. The girls may have had a hand in the color selection. Tires painted turquoise, lavender, coral and lime green are scattered about to dry before the students roll them into place. “I like bright colors,” admits Coss, and her fellow Greenhouse Girls agree. Two wicker chairs Culver found on the side of the road bound for the dump will be spray painted in equally-bright colors and placed near the garden entrance. The girls wonder out loud why anyone would want to throw out two perfectly good chairs.Do the girls have gardens of their own? “We started planting flowers in our front yard, and my mom’s thinking about putting in a vegetable garden,” said Ramirezhuezo. 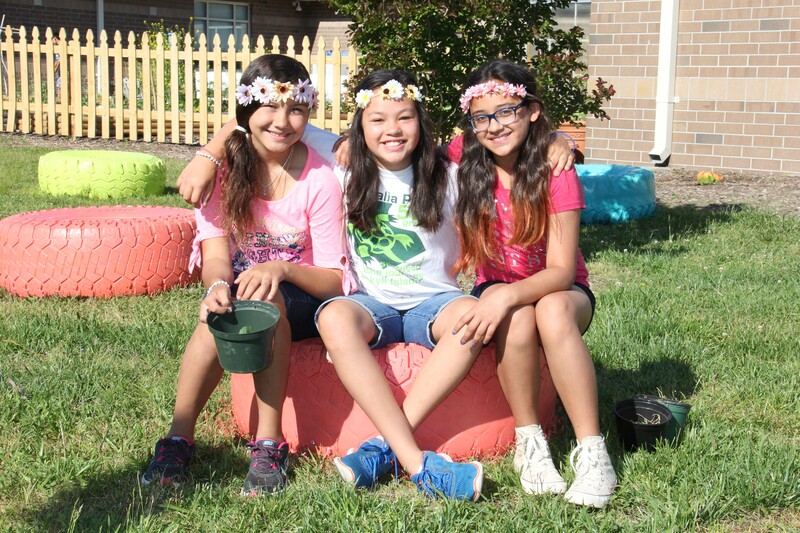 As fifth graders, the Greenhouse Girls will take their gardening skills to middle school next year – Coss to Kemps Landing/Old Donation School, Rao to Virginia Beach Middle and Ramirezhuezo to the Middle Years Program at Plaza Middle School. Who will combat the weeds when they are gone? Some of the girls plan to visit with their families this summer to help take care of Seatack’s garden. Also, they hope to find or initiate similar opportunities in middle school. Given the positive mark left by the Greenhouse Girls’ hard work this spring, one doubts Culver will have trouble recruiting new female student gardeners. “We’ll be happy to train them,” said Coss. To learn more about how you or your organization may support schools’ innovative learning projects through the Virginia Beach Education Foundation, visit vbef.org or contact Debbie Griffey at 757-263-1337. The community garden at Seatack simply would not have been possible were it not for the vision and dedication of an extraordinary teacher – Marie Culver. Her love, passion, and enthusiasm for gardening and sustainability are infectious and the children have clearly caught the bug! When a teacher’s methods and approach to teaching and learning come from a place of joy weaved within her high expectations for what students can and should do, children see the journey of learning as a relevant, worthwhile, and satisfying endeavor! They gain academic and LIFE skills which reflect a special brand of excellence. Way to go students and Mrs. Culver! We love you! I would like to start out by thanking Mrs. Culver and thanking the children involved in this project. It has definitely come a long way, the hard work and dedication put forth by the students have shown the exceptional leadership at Seatack Elementary. The community garden looks vibrant and splendid. As a proud parent, Seatack is on great path to success with the extraordinary staff there to facilitate. Great Job!